Not too long ago, I ordered a few Stampin' Up! things from a blogger friend of mine named Cely. There was a promotion going on, and I got to choose a free item. I decided on the Kindness Matters stamp set figuring it would come in handy for thank you cards. I also just loved the pretty butterflies! I decided to make some 3 x 3 note cards for this week's challenge over at Lollipop Crafts: Anything Goes! I inked up the butterflies with SU! ink in Real Red. I inked up the sentiment with Memento ink in Tuxedo Black. I didn't want to add ribbon to the notecards, but I still wanted to sort of jazz things up a bit. 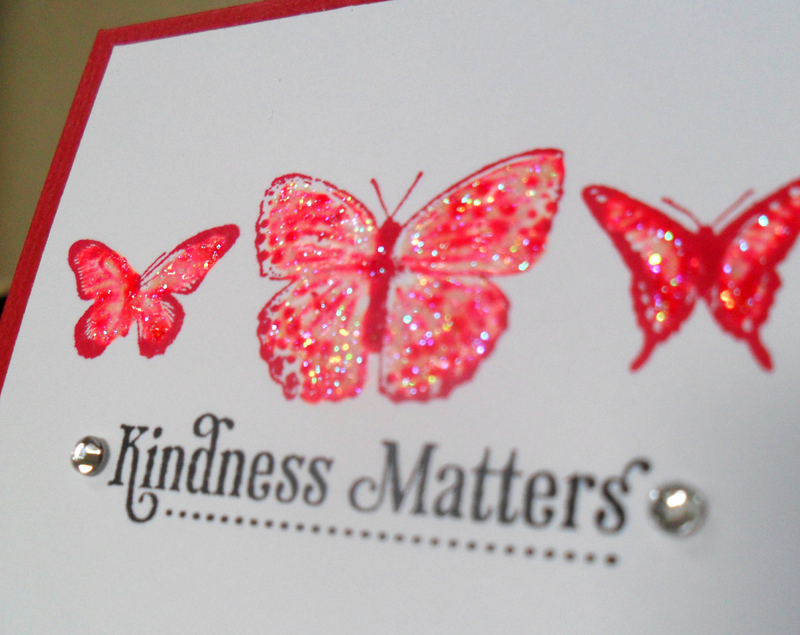 So, I added some bling and also Stickled the butterflies. I probably should have heat set the ink or embossed the image before adding the Stickles. It seems that the red ink actually bled slightly once I added the Stickles. I use Stickles a lot, and I've never had a problem with my ink bleeding. But, this might actually be the first time I've used Stickles with colored ink. I normally stamp with Memento, Clearly Better, or Staz-On. Here is a close up of the butterflies to show you the glitter from the Stickles and to show you the slight bleeding that occurred. Please excuse the blurriness in the photo. I'm still using my old camera until I find the charger for my new camera! GRRR!!! In the end, I decided that I didn't mind the bleeding after all. I actually thought it made for a cool effect! Now, before signing off, let me share a few tips regarding envelopes for 3 x 3 cards. Let's say you have a 3 x 3 note card for a thank you or birthday gift but don't have an envelope to go with it. One option is to punch a hole in the corner and thread some ribbon through it. Then, tie to the ribbon on the gift. Another option is to back the card with adhesive and stick the card directly to the front of the gift bag or present. Well, that's it for now. I have some major spring cleaning projects planned for this week, but I'll be back with more projects. See you soon! what wonderful mini note cards! I just love them! great job! I just got this set Dena, so it's great to see some inspiration with it. Great note cards. Bleeding, blurriness, camera, I don't think any of that matters!!! It is still lovely!! It's still beautiful!! Love it!! I don't think you could ever make a bad project!!! aww So beautiful! IT's a great idea, make a bunch of cards beforehand for occasions. Love 3x3 card and yours are aweome! The simple sentiment and image are lovely. I almost got something from that SU catalog, then I thought of all the other SU stamps I haven't used and told myself no. lol! looks so good! :) i shoulda got this stamp set for myself! shucks! Cute! cute! Cute!!!!! Love it!! Lollipop Crafts Challenge: Baby, Baby! Lollipop Crafts Challenge: Anything Easter Goes!